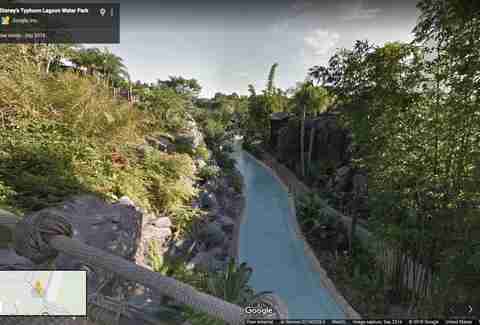 Google Maps now has street view in 11 Disney theme and water parks, as well as a handful of stores in Downtown Disney, which will get its first brewery later this year. Parks in Tuesday's launch include Disney's Animal Kingdom, the Magic Kingdom, Epcot Center, Disney Springs, California Adventure, Disneyland, Downtown Disney, Hollywood Studios, Typhoon Lagoon Water Park, ESPN's Wide World of Sports, and the Blizzard Beach Water Park. Most of these parks have seen admission costs rise again this year. So, maybe getting a glimpse ahead of time allows you to poke around and better plan your time at one the crowded parks. Or maybe it just lets you reminisce about a trip you loved. 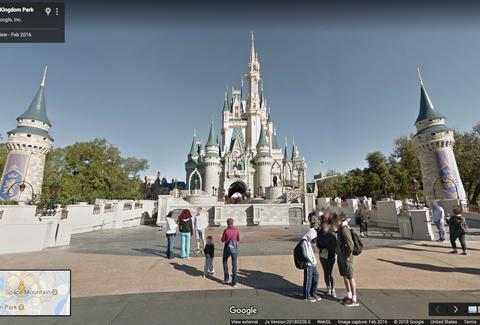 The new feature works like street view anywhere else Google might snap a photo of you while you're not looking. Search for, say, Epcot. Zoom in on the area, and then drag the yellow pegman from the lower right corner onto the map. You'll get a street-level glimpse of any area highlighted in blue under the pegman. Drop him, and it's like you're actually there, less the smell of hot dogs.